Home >> Baby Product Reviews >> Prizes From Spokesmoms! 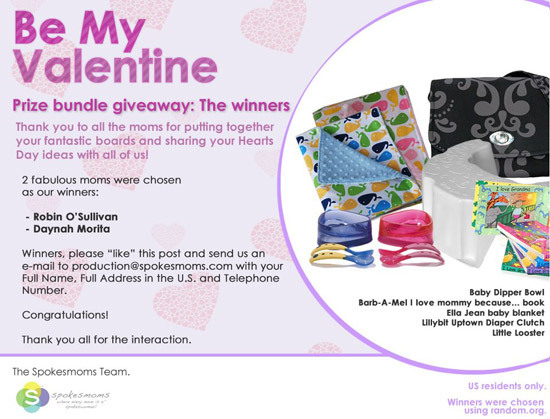 I’m so happy and excited about winning the big Valentine Giveaway Prize Bundle from Spokesmoms.com (Twitter | Facebook)! I’m so grateful for each of the sponsors. I loved learning about each of them as I pinned items on my Pinterest board. They’re all wonderful children’s produts and I can’t wait to try them out with my little girl! My daughter won’t start eating solid foods for a few more months, but I’m excited about this bowl! I love how it doesn’t slip or move, and you can really just use ONE HAND to feed the baby! The Baby Dipper bowl makes mealtime a fun and clean experience for all! Parents can use their free hand to clean or entertain baby, or to keep baby’s hands out of the bowl while feeding baby. Toddlers can see through the transparent sides of the bowl and concentrate on getting the food onto their spoons and into their mouths. All users of the Baby Dipper feeding set avoid the frustrations of chasing the food around the bowl and the bowl around the table! Ok, if you know me, you know I love all sorts of bags. And this one is no exception. It’s so darling! And best of all, it doesn’t even look like a diaper bag! It’s just so stylish, convenient, and functional! I can’t wait to try it out! Small and stylish, this diaper bag is full of surprises! The patented LillyBit Uptown Diaper Clutch is the stylish alternative to bulky diaper bags; designed with luxurious details and convenient features that allow modern parents to change baby in a snap! It holds and cleverly conceals essential baby gear – inside a unique tri-fold bag. Easily convert the strap to fit your personal style. Wear over-the-shoulder, as a handbag, wristlet or clutch. Once baby outgrows diapers, the Uptown Diaper Clutch can still be used for older children to carry snack packs, juice boxes or whatever the little one may need (we hear they also make a great cosmetic or travel bag for mom). Mom on-the-go has minimal baggage with everything she needs to feel confident and fashionable! Who can resist such a soft and beautiful blanket? I know I can’t! I would love to snuggle up in this.. I mean, my baby would. 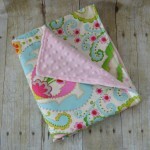 This beautiful baby blanket combines a modern print with soft and luxurious minky fabric for baby. Great for your stroller, car seat, play mat, etc. Perfect for a baby shower gift. Pink floral pattern on the front, with soft pink minky dot on the back. Generously sized at approximately 35″ x 29″. Machine Washable. Made in the USA. I absolutely love things that include personal photography.. and these books are just perfect for that! So private and personal, they make special gifts for little ones. I can’t wait to start dropping in all of my photos! The best part about this business and the creation of these books is knowing that children are reading with their families, smiling at photos or drawings and hearing those magical words, “I Love, I Love, I Love” and they know they are loved. In this crazy world we live in, it is so important for children to hear those words. The award-winning Looster Booster is revolutionizing potty training, one tush at a time. For all the years that those little legs don’t reach the floor. 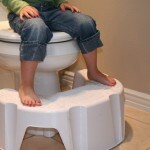 Truly the perfect potty step stool – the only one your little one will need. SpokesMoms, thank you again, as well as all of the wonderful sponsors! I’m can’t wait to start using your products! Congratulations! Those all look like great products. At the beginning of your post, I was like ‘clutch’? What? And then I was surprised to see it really is a clutch! Cool! And the Looster Booster is awesome – I wonder why somebody didn’t think of that a long time ago! Week 28: You have Eyelashes!